Downtown Nevada City is a favorite spot for local trick or treaters, and Broad Street is filled with an endless stream of little ghosts and goblins going from door to door to get their treats. Houses are covered in spider webs and lights. 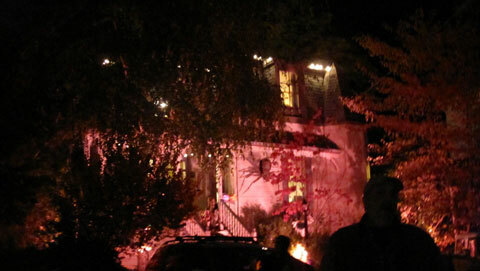 Trick or treaters are greeted by witches, warlocks, creepy sounds, and smoking cauldrons. The Victorian architecture of the homes, and the old deciduous trees of Nevada City are the perfect backdrop for Halloween. Miners Foundry holds its annual Fright Night on October 29th. It’s a fun event with party-goers enjoying a full-bar, food for sale & costumes which range from outrageous to traditional Halloween! Doors open at 8:00 p.m. and tickets are $20.00 in advance and $25.00 at the door. Tickets are available online at www.minersfoundry.org or at the new Nevada City Box Office, located in the Miners Foundry Annex at 325 Spring Street, in Nevada City. Mostly Mercer…The music of Johnny Mercer. The Bruce Kelly Quartet will be performing the music of Johnny Mercer and others in the ambience of the elegant nightclubs of days gone by. His quartet includes a trio of seasoned jazz players whose collective resumes run the gamut of jazz musicians and singers they have worked with, from Tony Bennett, Sarah Vaughn, Buddy Rich and Jimmy Smith to Lou Rawls and Herbie Hancock. The concert will be preceded by a sit down dinner prepared by Chef Austin Farrar. There will be a full no host bar. Bar opens at 6pm, dinner seating at 7; show starts at 8pm. Hear such Johnny Mercer classics as Blues in the Night, Days of Wine and Roses, Moon River, Dearly Beloved, My Shining Hour and many more! The event takes place on May 7th, Mother’s Day Eve, at The Miners Foundry Cultural Center, 325 Spring Street, Nevada City. Tickets are $25 for concert only; $55 for dinner & concert (Reservations required). Tickets available at The Nevada City Postal Company, www.brownpapertickets.com or at the door. Reservations deadline is May 4th. For ticket and other information or to make reservations for dinner and show call (530) 273-0507. Celebrate New Year’s Eve with a night of acoustic and electric jam at the Miners Foundry, 325 Spring Street in Nevada City. Doors open at 7:30 p.m., show starts at 8:30. Munchies, Deadbeat t-shirts and raffle tickets will be for sale too. Come and ring in the New Year while supporting Chicago Park School! Tickets are $30/advanced, $35/at the door. For more information, go to www.chicagoparkschool.org . New Year’s Eve will be celebrated Friday night, December 31st, from 6-9:00 p.m. in fine European fashion at the Nevada City Classic Café. Diners will enjoy the cafe’s regular Friday night menu, as well as delight in café owner Genevieve’s special delectable dishes. The enchanting Beaucoup Chapeaux, Nevada City’s 2010 Best Live Music recipients, will provide music.The Nevada City Classic Café is located at 216 Broad Street in Nevada City. Call 470-0544 for more information. Cooper’s ale works, located in historic downtown Nevada City, California has been a favorite live music venue for many years. “Jade & The Decent Gentlemen” will play New Year’s Eve starting at 9:00 p.m. There is a $10 cover charge. Cooper’s is located at 235 Commercial Street, Nevada City. For more information, please call 530-265-0116. Located on Broad Street, in the heart of downtown Nevada City, McGees is a local favorite. Join Mello DG for complimentary champagne on New Year’s. There is an $8 cover charge. McGee’s is located at 315 Broad Street, Nevada City. For more information, call 530-265-3205. The National Hotel, in the heart of Nevada City, is the oldest continuously operating hotel west of the Rocky Mountains. New Year’s Eve features live entertainment, and party favors at midnight with no cover charge. The dining room will be open for dinner. The National Hotel is located at 211 Broad Street, Nevada City. For more information, call 530-265-4551. In Grass Valley, Roy Rogers and the Delta Rhythm Kings will be appearing at the Veterans Memorial Hall with the Bob Woods Trio. Roy Rogers is one of the premier slide guitarists performing today. The Veterans Memorial Auditorium features the largest dance hall in the area, and is located at 255 S. Auburn Street, in Grass Valley. The show begins at 9:00 p.m., doors open at 8:00 p.m. For more information, see http://www.paulemerymusic.com/ or call 530-478-1974. 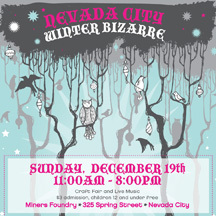 Sunday, December 19th, be sure to check out the Nevada City Winter Bizarre at the Miners Foundry Cultural Center at 325 Spring Street in Nevada City. The Bizarre will run from 11:00 a.m. to 10:00 p.m. and features a craft fair and live music. Admission is $3, children 12 and under are free. The Bizarre will feature hand-crafted gifts, jewelry, art prints, up-cycled and vintage clothing, bath body & home items, children’s clothing and toys, knit and woven garments, locally specialty foods, and children’s activities. Maria’s Taco Truck from Auburn will be at the Bizarre, and the beer and wine bar will open at 1:00 p.m. More information. For over 35 years, Thanksgiving Weekend in Nevada City has featured a major art event, attracting thousands of visitors from near and far. Since 1993, this event has been Artisans Festival at Miners Foundry, hosting a small but select group of artists and craftspeople whose quality artwork has attracted a loyal and growing audience of admirers and patrons. Thirty-six exhibitors fill all three halls at Miners Foundry, with many coming from as far away as Oregon, Nevada and southern California. Well known local artists include David Lee and his hand-hewn wood bowls, painters Jill Erickson and LeeAnn Brook, glass artists David Lewin and Robert Kahl plus many more, working in fiber, clay, jewelry, wood and mixed media. The festival also features live music, with Paul Emery in the Stone Hall, and Ludi Hinrichs and Friends in the Great Hall. Cafe seating plus good food and drink, including espresso, wine, soups and salads make the festival a welcoming destination for all. Artisans Festival is Miners Foundry’s biggest fundraiser of the year. 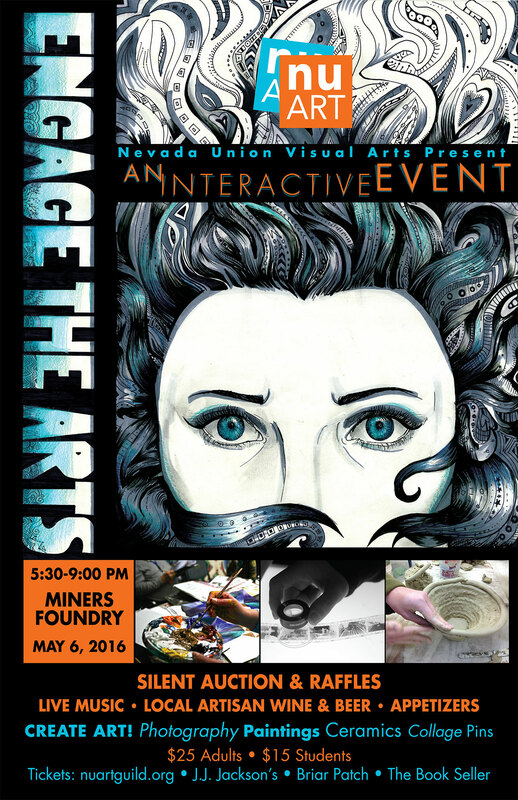 Your $3 admission supports the Foundry; kids under 16 are welcome free of charge. The event is open all three days of Thanksgiving Weekend from 10 to 5. For additional information or questions, call the festival’s producer at 470-0369, or save the special Artisans Festival insert in The Union edition of Monday, November 22. 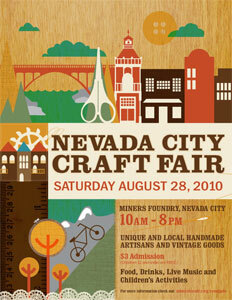 Miners Foundry Cultural Center is located at 325 Spring Street in downtown Nevada City, next to Nevada City Winery. Features: Fine Art and Fine Craft in a festive, historic atmosphere; good food and drink, live music. Thirty-six local and regional artists working in painting, sculpture, photography, fiber, clay, jewelry, wood, glass. Cost: Your $3 admission supports Miners Foundry; kids under 16, free! Come and peruse the work of over 50 unique local artisans. This event features handmade items, vintage goods, jewelry, art, crafts, housewares, clothing, stationery, books, and more. The Craft Fair will also feature children’s activities and live entertainment.